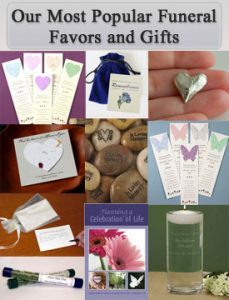 Do you need funeral favors ideas to help make a funeral memorable and personal? 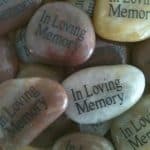 If you are planning a celebration of life, these mementos will make special funeral gifts for attendees. 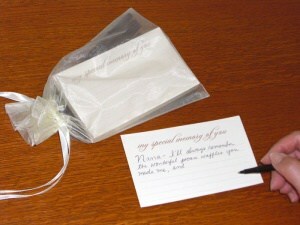 If you are attending a memorial service, how about contributing funeral favors to the person planning the funeral? 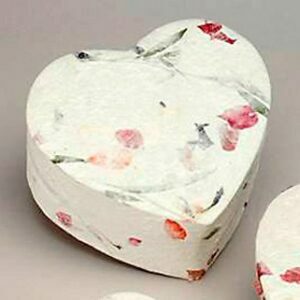 They will appreciate the help and have a funeral souvenir forever to help remember their loved one. 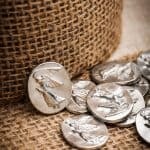 Modern trends in funerals are causing people to move away from the traditional flower arrangements as memorial gifts towards more unique options. 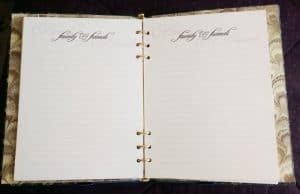 The gifts on this page allow you to give a funeral favor or memento that will be a souvenir kept for years to come as a tribute to your loved one. 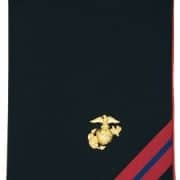 How Can I have Family and Friends Share Their Memories? Dove Share Memory Card Set – Collect your guests’ memories on these cards as they enter the service. 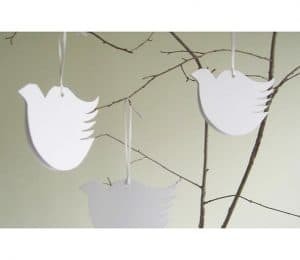 Then hang them on a tree to display them beautifully. You only have one chance to collect everyone’s memories. 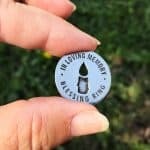 Consider lined 3” x 5” cards that say, “My Special Memory of You ” These share memory cards and pens are handed to friends and family as they walk into the service. 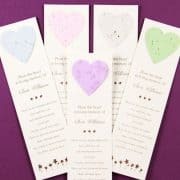 The celebrant or funeral director can be responsible for handing them out and collecting them at the end of the service. These cards can be put in a pouch and taken out and shared as a memento at family gatherings for years to come. They become a reflection of ancestors’ lives for generations to come. The dove share memory cards open up and memories are shared inside. Using the cards allows several people to write their memories at the same time, making the process much more smooth. Also available as butterfly cards. 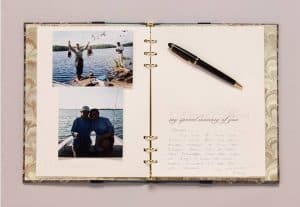 You may want to consider a memory book/guest book/photo album combination that is ideal for capturing the essence of the person- their passions, hobbies, interests, accomplishments and family history. You can make completing the book a family activity… encourage children, grandchildren and all family members to participate. It will be therapeutic and rewarding; collecting photos, memory cards, notes and letters. Share friends and family’s personal memories by inserting the “My Special Memory of You” cards into the book. Additionally, the book can be used as a guest book at the life celebration. The sign-in pages and memory cards can be removed and spread out on a table, so that guests don’t have to wait in a long line to sign in. This book will be treasured for generations to come. 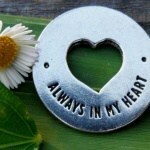 Consider putting pocket charms on the table that reflect your loved one. Guests are encouraged to take one as a souvenir. They will put them in their pocket or purse and when they run across it they will remember the departed. 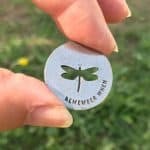 You may also want to consider personalized seed cards that contain wildflowers. 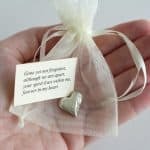 The cards can be placed on the memory table and friends and family can take them and keep the card as a keepsake and plant the seeds. 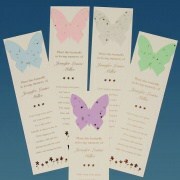 They can be personalized with your loved one’s name and a message. 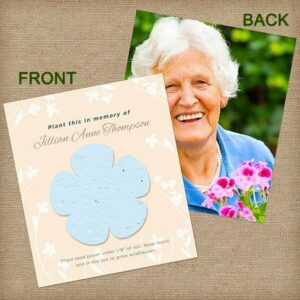 Photo grow cards are a nice option to give to guests at the funeral. 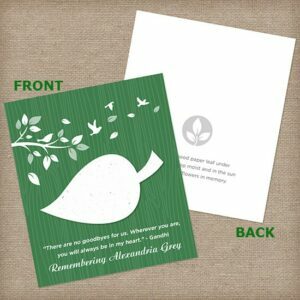 The card has a photo on one side and a plantable seed paper shape on the other. It is personalized with your loved one’s name. 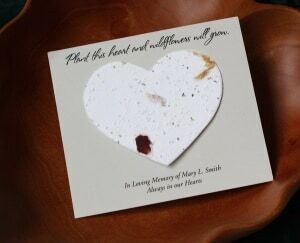 “I just wanted to let you know-we had my mom’s memorial service/celebration of life Sept 2 at HoChunk Casino/Convention Center in Wisconsin Dells, Wisconsin (one of mom’s favorite places 🙂 I placed a dollar casino token and one of the wildflower seed inscribed heart cards that I ordered from you at each place setting at the tables. People commented and really thought they were great. Thanks for offering such a wonderful website – you were a godsend at a really difficult time.” Kimberly T.
Give out engraved memorial stones to guests at the funeral or memorial service. You can scatter the stones around a candle. Stones with blank side on the back can be written on with Sharpie permanent pens by guests. 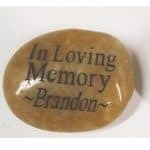 Or stones can be personalized with a loved one’s name. The smooth river rocks are sturdy and can be kept in a purse, next to the bed, or outside in the garden. What a perfect way to honor a loved one. These ... >>READ MORE. 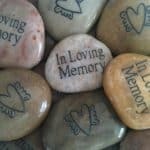 Engraved Memorial Stones can be featured on a desk, table ... >>READ MORE. 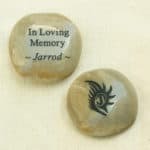 Pocket Memory stones for funeral gift or favor. 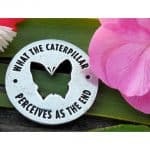 Engraved with ... >>READ MORE. You may also have families and friends light memorial candles. You could have a procession and put the candles around the casket or urn. Candles can then be given to families and friends as keepsakes at the end of the ceremony. 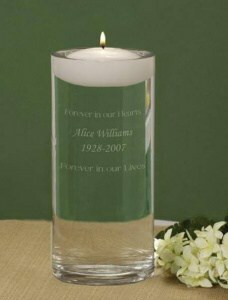 You may also want to consider a memorial candle and bud vase that can be inscribed with your loved ones name. Every year, on significant dates you can place fresh flowers in the vase and light the memorial candle. 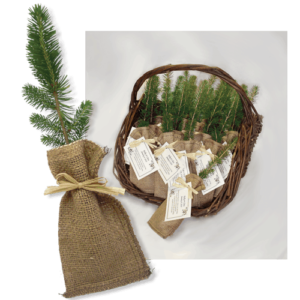 At the memorial service, offer friends and family a memorial tree seedling to plant in memory of your loved one. For years to come, the legacy of your loved one will live on through the trees. 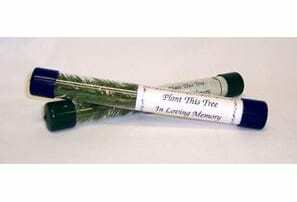 Each 10″ Remembrance Tree is individually packaged in a clear, reusable tube that contains your customized message. The memorial tree in a tube creates a micro-climate in which the tree can survive for thirty days before being planted inside or out. A poem is included on the insert. The tree itself becomes a memento or souvenir as a tribute to your loved one. Remembrance Trees in Burlap can be planted in memory. Need more help? Download our guidebook Planning a Celebration of Life for tips, ideas, examples, and a handy checklist. 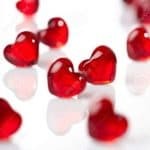 More resources: Ideas for how to personalize a funeral or memorial, Funeral Memorial Songs, and our extensive collection of Funeral Poems, Readings and Verses.